A philosophy of science paper arguing, in this chapter, that 'time' scales through three dimensions in a fourth, as may be illustrated by the Hypercube and Fractal graphics. Please visit the author's AMAZON KINDLE page to purchase the entire book, TIME'S PARADIGM. as if by the mere act of looking at the piece we give it life." This paper strongly advocates a 'tenseless' Block Universe Model, as discussed in previous chapters. We have established that individual, separate points in time and space cannot exist in order for there to be progress, and that all material existence is therefore connected in time and space. Nevertheless, humans have a need to express existence, and use the limiting factor of three dimensions to do so, disregarding time unless motion is applied. Dimensions: arbitrary concepts trying to make sense of physical shape and form in a seemingly, static World. However, add a period of time to a mobile object and our three dimensional diagram becomes distorted - but in which direction?. We assume, in the direction of physical motion; a sphere, such as a rolling ball, becoming a sausage; or a square becoming a rectangle. We forget that even an apparent immobile object is in motion, on an atomic scale. It, too, is at the mercy of time, even though it remains, from our perspective, as the same three dimensional shape it was a few minutes ago. Displacement is not time. Time and our passage from one moment to the next is something else. We certainly don't feel like we are somehow always attached to our past or future selves. The present feels individually disengaged, totally by itself. But perception is riddled with illusions and not always to be trusted. The well-known thought experiment, first developed by Edwin Abbott in his satirical novel Flatland, describes: a flat worm on a sheet of paper living a perceived two dimensional existence. It can see and move left and right, forwards and backwards, but it cannot see your face peering down at it from above. Even if it had the brain to consider, it would not believe there was a third (up and down) dimension. We live in a perceived three dimensional existence. And just like the flat worm, we are unable to perceive another dimension beyond the three we inhabit. It is likely there is one, as there is for the flat worm, but it is impossible for us to visualize or, for that matter, to comprehend it. We can consider a 3d existence without time to be a 'singular state'. A state with potential, in readiness, but not actually capable of anything. All things within it are connected because no distance exists between things. For there to be space or distance then there is the potential for motion - and so, time. We look at our physical existence as just being. We look at our hands and feet and see them. We don't see lines or angles, we just see form. Mathematicians, however, devised a way of explaining our visible existence by segmenting it. They considered a circle drawn on a piece of paper and then another cutting it at right angles. Then they were able to accurately formulate rules that applied to our physical status, like dimensions. The shadow cast by a line produces the illusion of a square in two dimensions (as on a piece of paper). A square's shadow produces the illusion of a cube in three dimensions. That, you might think, is that. Not so! Mathematics went further: The shadow of a cube produces the illusion of a strange thing called a hypercube in a 'so called' fourth dimension. What does this hypercube look like? 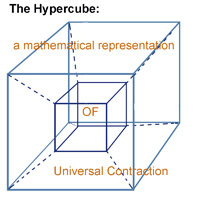 As shown above, it is often drawn as a cube within a cube, each connected to the other by straight lines from their corners. A big cube outside a smaller cube, or a small cube inside a big one. It appears the fourth dimension is being presented to us as a progression from one size to another. Just as a line drawn in one dimension flows through a second to form a square; here we have a cube in three dimensions flowing through a fourth. This prompts the extraordinary suggestion that we are either expanding or contracting through another dimension. An equal and simultaneous change in all three spatial dimensions, thus creates a plausible progression for time. Now, a static object can be plotted in time. However, if all matter in the Universe is changing proportionally through time in the same manner, then we still perceive the object to be static. This gives us the opportunity to relate to the worm's dilemma, as we might also be unaware of a vast area of invisible reality, existing seemingly, right before our eyes. Such a dimension of time could be described as a fractal progression, a solid structure composed of all matter in the Universe, flowing from the past to the future. Material existence, then: a repetitive structure scaling up or down, shrinking within itself or expanding out while remaining consistent to a theme. Such illustrations suggest progress, fluidity, purpose and relevance. Fractal progression - a logical next step beyond the Hypercube. Everything around us seems to be on the move: trees, clouds, mountain ranges, continents; none of them predictable in how. Things influence development, and the more things that influence the greater the impossibility of predicting an outcome. Progression is because of a perceived notion of change. As someone once said: "If it can happen it will". Yet, something as uncontrollable in appearance as a tree or as bizarrely beautiful as a fractal image does have some method to its madness. There are rules in Chaos - or equations when developing fractal graphics - so there is purpose in progression; and that purpose has a name: Evolution. Not just the evolution of life and its repetitive nature - as we discussed earlier - but the evolution of all inanimate, crystalline, cultural and indeed, cosmic phenomena. It doesn't have to be an intelligent purpose, it is inherent in all things that move. It just has to work. The incredible fractal similarities between certain Indo-Pacific soft corals of the Dendronphthya genus and the inflorescence or flower of a mango tree, suggests reason. There is a need for the passing of time in order for there to be time. And in the case of this universe it appears that the overriding principal is 'repetition'. In the words of the father of Fractal Mathematics himself, Benoit Mandelbrot, "Self-constrained chance". There is very little difference between one moment and the next, they are almost identical, as if time were merely repeating itself, with tiny variances as we proceed. We move about, seemingly with much haste, unlike the landscape, so we think we are making progress, we think we are changing a lot, but is that really the case? From a street level point of view, yes, we are rushing here and there in cars, on bikes, clouds and aeroplanes are passing overhead, etc.. But from a cosmic point of view our planet is a ball in orbit. None of those tiny movements on its surface are of any significance; every mobile creature is part of the Earth, simply creating minor fluctuations, vibrations; as we might perceive vibrations when observing an electron about its nucleus. We are but dust on this planet, we are not as individual as we might think we are. We are earth, we are of this Earth, attached by gravity and particle attraction. Our planet is one, a collective; it has progress while we are simply dragged along for the ride. We are all attached to this planet through one level to the next - one great revolving system. As we zoom in on our planet from space we can observe the surface beginning to show form, like zooming down through a static 3d fractal graphic. Undulations and vibrations are evident, but not of individual consequence. And, as with a fractal, we can continue to zoom in, going beyond the surface of the planet, to the surfaces of the structures thereon. By adding the dimension of time to this above illustration of our planet, we simply add the repetitive nature of progress, from the past to the future. We have evolved by conditioning, we respond to situations through repetition. Every choice we feel we have made is made by past experience, as was discussed in previous chapters. This is developed further in the supplement, Making Choices. We duplicate, we facsimilate, everyday that passes is seemingly so like the one before. Chaos Theory was a development of Mandelbrot's work, and is now common place in everything from weather patterns to the stock market. Things that flow, replicate. Time flows, it replicates. Fractal graphics have created some extraordinary progressions in two and three dimensions. One might expect, therefore, that in the near future we will be seeing iterative equations tackling the very essence of time, itself. The significance of The Golden Ratio, or Fibonacci's sequence, in Chaos Theory is particularly interesting when we consider it's relevance to time in the next chapter. If the rate at which we scale is governed by such a mathematical factor and can also operate within thought experiments and formulas involving Special Relativity, then this seeming coincidence is worth investigating. Time's Paradigm, proposes that all of existence in the Universe, from the past through to the future, is likely akin to one giant, four dimensional fractal expression. Conscious beings may experience a sense of flow through this structure, giving rise to the notion of time, however it all exists at once. Events occur and re-occur, cycles return, actions repeated time and again by all things; and all of this happens to every last body in the universe however big or small, because they are connected to their earlier or later selves by an elevator of scale. The question, then, is are we expanding through this dimension of time or are we contracting? To begin with, we all expand and contract depending on the amount of energy we have. Hot things get bigger, atoms swell; cold things get smaller by reverse, a lowering of atomic levels. Something travelling at high speed has more energy, so will be more massive. Clearly, water that has been heated will expand as it turns to steam, hence the whistling kettle. Atomic particles get agitated by added energy and create more space for themselves. There is plenty of evidence that we do not remain uniformly the same size all the time. Contraction of objects in motion was first considered by scientists at the turn of the last century as a way to explain the peculiar properties of light. It became incorporated into the theory of Special Relativity and will become significant to this paper later on. So, going into the kitchen a few minutes ago to make a cup of coffee is now not only something that happened a million miles away (as we explained previously) but also you might have been a completely different size. Just like the flat worm that requires a third (up and down) dimension to exist, a three dimensional 'singular state' requires time for there to be existence. But, we can't actually see time, which means existence itself is a limited experience. Unless, we create an opportunity to look down at ourselves, as we did at the flat worm. To express this in any kind of visual sense, we need to suspend existence in something we happen to be looking down from: we will call it, The Nth Dimension. Let us just consider a large black expanse of nothing - like eternal night. As, nothing does not exist, this Nth Dimension is a mere paradox, existing only to satisfy our imagination. Peering in, we might see as if a huge ball of light. However, we would not actually be able to see it; light would not escape into our void as photons are an integral part of existence, alone. This ball is everything, from the past and on into the future. A vast cyclical arrangement; but as we are not influencing a present moment, we see no flow in time. We just see the whole incredible progression as one, including the space between things. The vast landscape of time confronting us would be as if a string of pearls, with each moment being a single bead. As one moment pushes up against another, the entire string moves simultaneously. Everywhere would be the present. Consciousness would be throughout. Inside our existence - our universe - there is space, but not empty space, it is energetic; outside our universe there is nothing, not even space. For space to exist there needs to be an area between objects to be called space, and that space interacts with those objects. In the singular (three dimensional) state there is no space. Everything is touching. Time creates space. If something can be created it must be of energy - it is energy. Nothing cannot be created. All things that exist are connected, even space. As discussed earlier, if nothing existed beyond a certain point, movement would not be possible. Space is not! Further to this argument, no single dimension exists, on its own. There can be no time without physical dimensions, nor can there be one or two of them without time. Put simply: there are no dimensions. Existence is one, big, solid thing. Directions are arbitrary lines which we conceive and name for the sake of understanding. "You have to be in a dimension above the one you walk, in order to fully appreciate all you have." The problem is, we cannot knowingly observe or scrutinise this dimension which seemingly floats above us; that we cannot touch. However, now we have the prospect of a directional flow in time, that we can visualise, a passage by which we all abide. In the next chapter, part 5. Velocity, we will consider contraction of matter through time and the Universe as being more likely than expansion, and we will examine what governs this flow of time. No unauthorised use of the material published or the concepts described herein is permitted.